from the BBC program Front Row, 31 October 2008. John Hoyer Updike (Mairch 18, 1932 – Januar 27, 2009) wis an American novelist, poet, short story writer, airt creetic, an leeterar creetic. Ane o anerly three writers tae win the Pulitzer Prize for Feection mair nor ance (the ithers war Booth Tarkington an William Faulkner), Updike published mair nor twenty novelles, mair nor a dozen short-story collections, as well as poetry, airt an leeterar creeticism an childer's beuks during his career. Hunders o his stories, reviews, an poems appeared in The New Yorker stairtin in 1954. He an aa wrote regularly for The New York Review of Books. His maist famous wark is his "Rabbit" series (the novelles Rabbit, Run; Rabbit Redux; Rabbit Is Rich; Rabbit at Rest; an the novella Rabbit Remembered), which chronicles the life o the middle-cless everyman Harry "Rabbit" Angstrom ower the coorse o several decades, frae young adulthuid tae daith. Baith Rabbit Is Rich (1982) an Rabbit at Rest (1990) war recognised wi the Pulitzer Prize. ↑ "John Updike". Front Row. 31 October 2008. BBC Radio 4. Retrieved 18 January 2014. 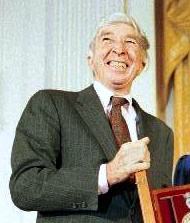 ↑ 2.0 2.1 2.2 2.3 2.4 2.5 2.6 "American Centaur: An Interview with John Updike". The New Yorker.